Progressive Charlestown: How do you like your scallops? How do you like your scallops? 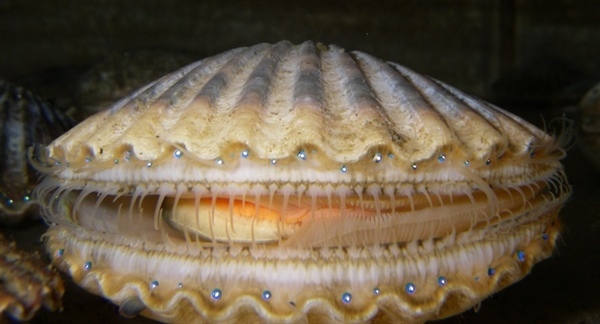 After six hours exposure in the laboratory, billions of particles measuring 250nm (around 0.00025mm) had accumulated within the scallop's intestines. Dr Maya Al Sid Cheikh, Postdoctoral Research Fellow at the University of Plymouth, led the study. She said: "For this experiment, we needed to develop an entirely novel scientific approach. We made nanoparticles of plastic in our laboratories and incorporated a label so that we could trace the particles in the body of the scallop at environmentally relevant concentrations. The results of the study show for the first time that nanoparticles can be rapidly taken up by a marine organism, and that in just a few hours they become distributed across most of the major organs." Professor Richard Thompson OBE, Head of the University's International Marine Litter Research Unit, added: "This is a ground breaking study, in terms of both the scientific approach and the findings. We only exposed the scallops to nanoparticles for a few hours and, despite them being transferred to clean conditions, traces were still present several weeks later. Understanding the dynamics of nanoparticle uptake and release, as well as their distribution in body tissues, is essential if we are to understand any potential effects on organisms. A key next step will be to use this approach to guide research investigating any potential effects of nanoparticles and in particular to consider the consequences of longer term exposures." Accepted for publication in the Environmental Science and Technology journal, the study also involved scientists from the Charles River Laboratories in Elphinstone, Scotland; the Institute Maurice la Montagne in Canada; and Heriot-Watt University. It was conducted as part of RealRiskNano, a £1.1million project funded by the Natural Environment Research Council (NERC). Led by Heriot-Watt and Plymouth, it is exploring the effects which microscopic plastic particles can have on the marine environment. Ted Henry, Professor of Environmental Toxicology at Heriot-Watt University, said: "Understanding whether plastic particles are absorbed across biological membranes and accumulate within internal organs is critical for assessing the risk these particles pose to both organism and human health. The novel use of radiolabelled plastic particles pioneered in Plymouth provides the most compelling evidence to date on the level of absorption of plastic particles in a marine organism."